My mother passed away, back in 2007, due to the awful effects of Alzheimer’s (such a horrible disease!). I still miss her (along with my Dad)…it’s amazing how strong the parental ties are, even after these many years. 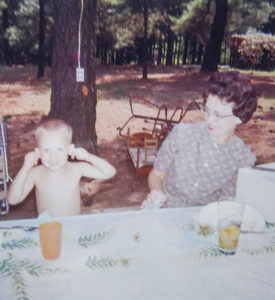 My Mom was a “southern belle” (born and raised in Georgia), but lived during the feminist era (which caused many interesting “discussions” with my Dad, I’m sure). Yet she always tried her best in raising my brother and I…she loved us, was firm with us, taught us right from wrong, and always wanted the best for us. She gave a lot of herself to us…and I will be forever grateful. During my late elementary school years, I wanted to learn basketball (which was fine with my parents…they both played during their high school years). My Mom spent many hours with me in our backyard court, showing me how to dribble, pivot, and shoot the ball. She really enjoyed that! Another thing my Mom could do was cook!! And like no one else, let me tell you! She was of the old school…no recipes, all from memory…and she almost never measured anything. Here is how she made biscuits: she would grab the large Tupperware bowl of flour, press her fist into it to make a “bowl”, and then pour milk, a raw egg, and some other stuff, and then mixed it all up in the flour bowl! She would then grab the dough, flatten it out, then cut out the biscuits and cook them. Yum! !…they were great!! Thank you Mom for your love and devotion. And Happy Mother’s Day!! This entry was posted in Non-Technical and tagged Mom, Mother, Mother's Day on May 8, 2016 by sr71rocks.